The man in the white shirt is witness no. 2, 41-year-old Bank Negara Malaysia investigator Azizul Adzani Abdul Ghafar. KUALA LUMPUR (April 15): Documents on the AmBank bank accounts of former prime minister Datuk Seri Najib Razak, SRC International Sdn Bhd and Gandingan Mentari Sdn Bhd implicated in the trial involving the former premier were seized by Bank Negara Malaysia (BNM) back in July 2015, according to the second witness of the trial. BNM investigation officer Azizul Adzani Abdul Ghafar, 41, was part of a group of three BNM officers in the raid into AmBank's operating branch along Jalan Raja Chulan under Section 4 of The Anti-Money Laundering, Anti-Terrorism Financing and Proceeds of Unlawful Activities Act 2001. From the raid on July 6, 2016, BNM obtained eight folders containing information in relation to the setting up of four accounts under Najib's name, three SRC accounts and one under Gandingan Mentari. 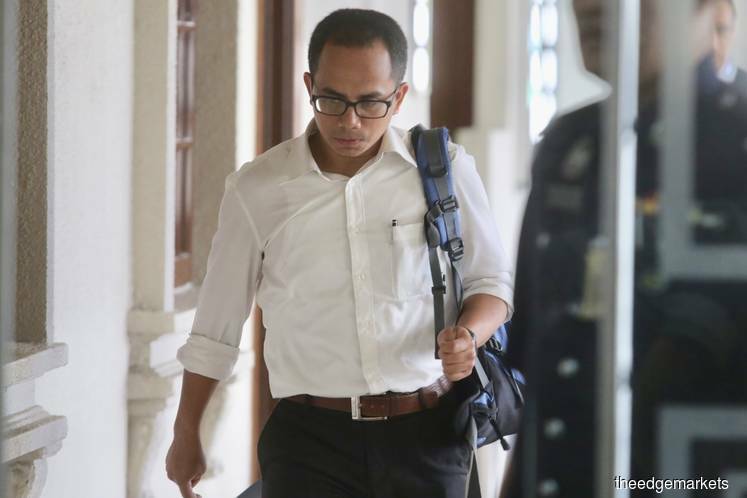 Azizul was the second witness to be called on by the prosecution for the trial, which commenced for its second day at 9am today. Earlier, Companies Commission Malaysia assistant registrar Muhammad Akmaluddin Abdullah, 35, confirmed that SRC was not a unit of 1MDB when it was formed on Jan 7, 2011, up until August 2011, when 1MDB Energy Sdn Bhd became its holding company following a resolution by SRC directors. It was also pointed out that a foundation under SRC, Yayasan Rakyat 1Malaysia, had Najib appointed as director in January 2013, to join ex-1MDB chairman Tan Sri Lodin Wok Kamaruddin and Datuk Wan Ahmad Shihab Wan Ismail. The late Datuk Azlin Alias, who previously led Najib's economic policy team, later also joined Yayasan Rakyat 1Malaysia as director until his passing in April 2015 in a helicopter crash in Semenyih, which killed six, including former minister Datuk Seri Jamaluddin Jarjis. In this trial, Najib is facing seven charges, namely one count of abuse of power, three counts of criminal breach of trust and three counts of money laundering involving RM42 million allegedly siphoned from SRC. The proceeding is adjourned for recess and will continue at 2.30pm.